Curtis Fleming has fished the world – and nearly every West Virginia county. He has also come full circle with his passion for fly fishing; a hobby he became intrigued with when he was a student at Bridgeport Junior High School and the late Joe Leonette headed up the school's outdoors club. Fleming went to Hinkle/Deegan Lakes with Leonette and other instructors and students and that was it. He was hooked. 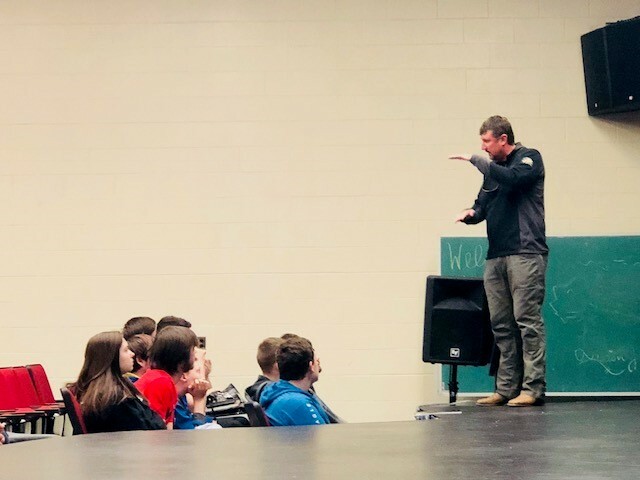 Friday, Fleming spoke to members of Liberty High School’s Fishing Club; a student organization started a few years ago to promote outdoor activity and give kids fishing opportunities and other hands-on learning opportunities in the great outdoors. Faculty sponsor Jeff Rush said just over 20 students were members of the first club in 2016. This year, about 45 come to monthly meetings and special events, such as Friday’s visit from the “Fly Rod Chronicles” host. Fleming shared with the kids an episode of his show; one which featured fly fishing and turkey hunting in the Mountain State. Jeff Rush, faculty sponsor of the LHS fishing club, said club members had been introduced to Fleming and his work prior to his visit. “We have showed a couple of his episodes before to expose them to all the places you could fly fish in the state and across the country, giving them another perspective of fly fishing,” he said. The club’s monthly meetings feature instruction on fishing, fly tying and the making of casting nets, among other activities. Some members participate in bass fishing tournaments, which provide scholarship opportunities. The group also goes fishing together, both here in Harrison County and in the mountains of West Virginia. “Last year, we made a trip to Harman’s Cabins and we have another there trip planned for March,” Rush said. West Virginia Department of Natural Resource Officer Ben Riley assists with club activities and accompanied the young fishermen to Harman’s Cabins in 2017. Riley told the LHS fishing club members how fortunate they are to have prime fishing spots right in their own backyard. Fleming elaborated. One of the students asked about Fleming’s favorite fishing spot in West Virginia, to which the FRC host quickly replied, Bemis. The fishing is good. So is the solitude. The spiritual aspects of fishing – being alone in nature and spending time with friends – is a benefit of fishing that should not be overlooked, he said. 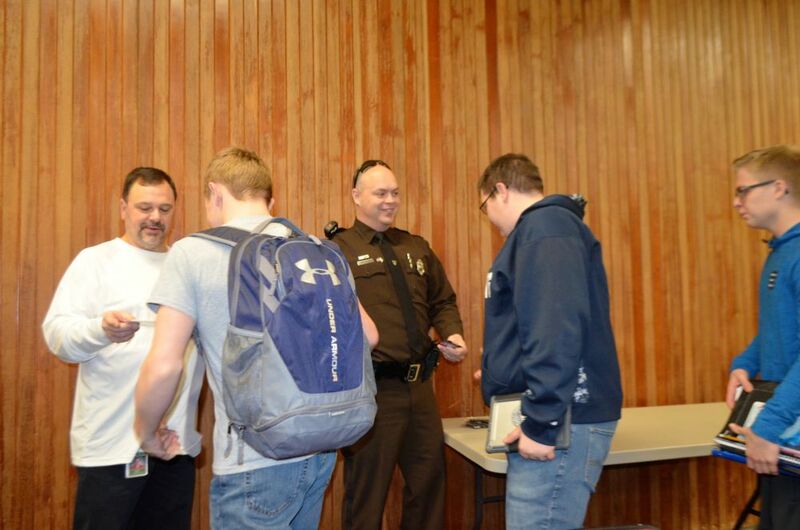 Also assisting with the club are Harrison County Sheriff’s Deputy Cody Shingleton, LHS educator, Alex Hoskinson and Sgt. First Class Jeremiah Sale of the U.S. Army Recruiting Center in Clarksburg. When wrapping up his presentation, Fleming reinforced the fact that the students are blessed to have so many people taking an interest in their wellbeing and playing a role in nurturing their interest in fishing. LHS Junior Hunter Webb has been a member of the fishing club since he was a freshman, shortly after his family relocated from Florida. He had done a lot of fishing in Florida and in West Virginia. He said fishing is the ideal hobby and an awesome way to pass time. Having a club at school - tying in his extracurricular interests with his education - has made attending school more fun. He said he found Fleming’s presentation and question and answer session electrifying and he is one of the show’s newest fans. The club – and Fleming’s words about how FRC resulted from a childhood dream – has aspired Webb to become a better fisherman and learn as much as he can about the sport. Rush shared how he became interested in fly fishing. 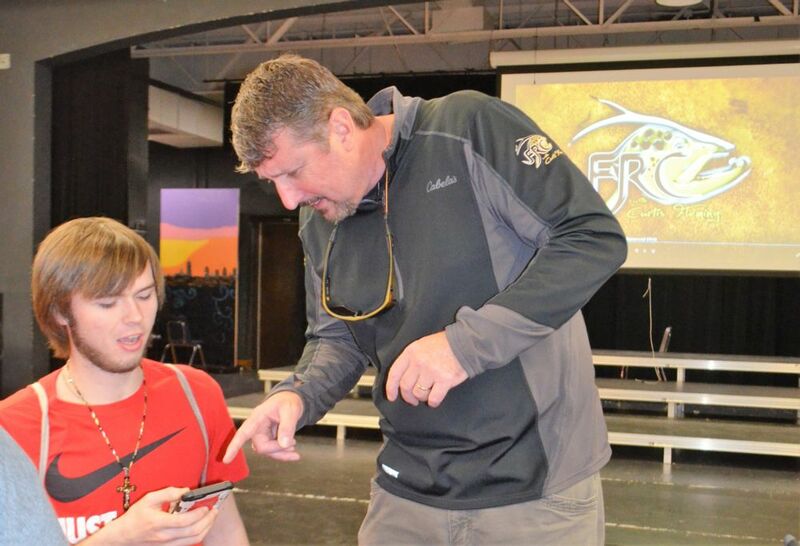 When the opportunity arose to expose kids at LHS to fishing, he jumped on board, he said. All three of his sons fly fish and his oldest, a senior at South Harrison High School, heads up the fishing club there. 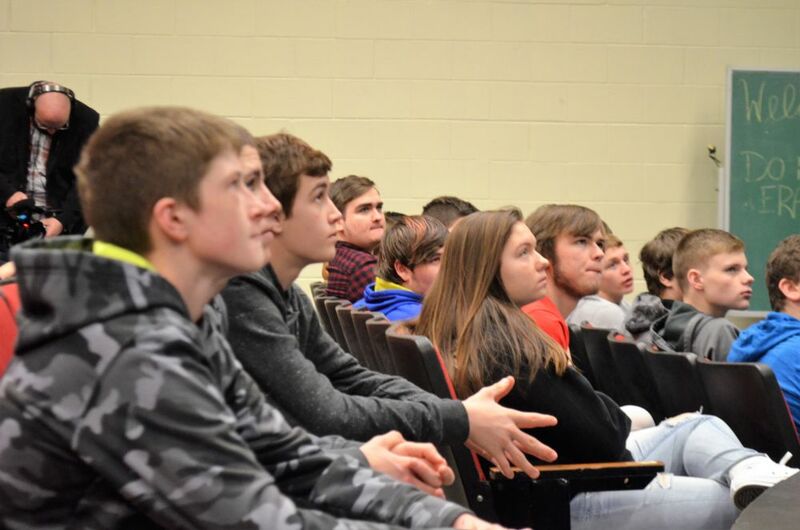 Currently, Liberty and South Harrison are the only Harrison County schools that offer a fishing club. Robert C. Byrd is in the process of organizing a club. Riley said he would like to establish one at Bridgeport High School, if a faculty member is interested in sponsoring. Editor's Note: After airing several years on the Outdoor Channel, "Fly Rod Chronicles with Curtis Fleming" now airs on Pursuit. Read about it HERE. Visit the Fly Rod Chronicles Web site and stay up to date with air times and other FRC news HERE. Pictured top/cover is Curtis Fleming with Liberty High School's Hunter Webb. 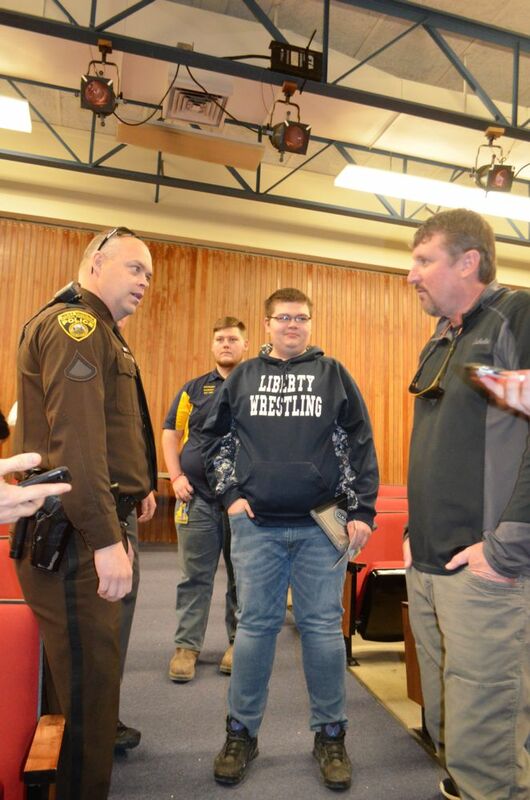 Also pictured above is Fleming addressing fishing club members and WVDNR Officer Ben Riley and LHS Fishing Club faculty sponsor Jeff Rush distributing FRC decals and other promotional materials and Riley and Fleming talking with students. See more images captured at the gallery link below.